2013 was a busy year in the Ponzi Scheme world. In total, at least 67 Ponzi schemes were uncovered, with the total cumulative dollar amount of nearly $3,000,000,000 - that's 3 billion dollars. This equated to the discovery of a Ponzi scheme (1) more than once per week, (2) every 5.4 days, or (3) every 130 hours. This included at least eight Ponzi schemes with estimated losses of at least $100,000,000 or more, with Edward Fujinaga's estimated $800,000,000 Ponzi scheme ranking as the largest Ponzi scheme exposed in 2013. In terms of sentences handed down, at least 117 offenders received prison sentences that totaled more than 1,000 years. These sentences ranged from mere months to decades in prison, with Karen Bowie's 42-year sentence ranking as the highest Ponzi sentence handed down in 2013. 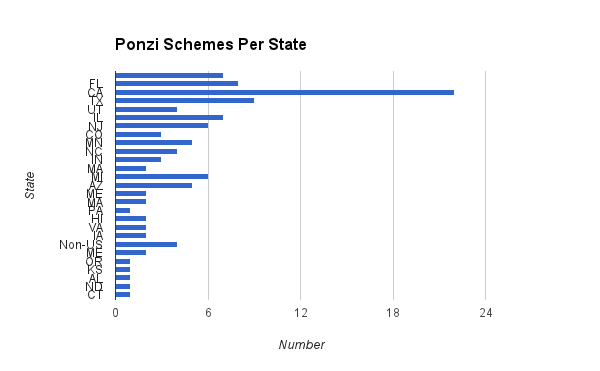 The total dollar amount of the Ponzi schemes for which sentences were levied: over $13 billion.